The Unification Treaty, in which the incorporation of East Germany (Deutsche Demokratische Republik) within the Federal Republic of Germany under Article 23 of the German Basic Law states that: "The capital of Germany is Berlin. The question of the seat of Parliament and Government will be decided after the unification of Germany". With the sign ing of this treaty, however, Berlin only had the status of being a symbolic capital city. This compromise solution was chosen because at that time political unity about the future state capital could not be reached. The achievement of German unity should not, however, fail because of the question of the capital. Considerable doubts about Berlin as the capital and seat of government remained for a long time, in particular in the old Federal Republic - i.e. West Germany. Just how narrow the majority for those favouring Berlin was, could be seen on the 20 June 1991 when the German Bundestag voted on the "Motion for Completion of the German Unification". After a controversial debate the motion was approved by 338 to 320 votes. With the passing of the motion, Berlin was also established as the seat of the German Bundestag. The Federal Government was appointed to take "appropriate measures", "to meet their responsibilities for the Parliament in Berlin" and to "relocate the key areas of government functions in Berlin". 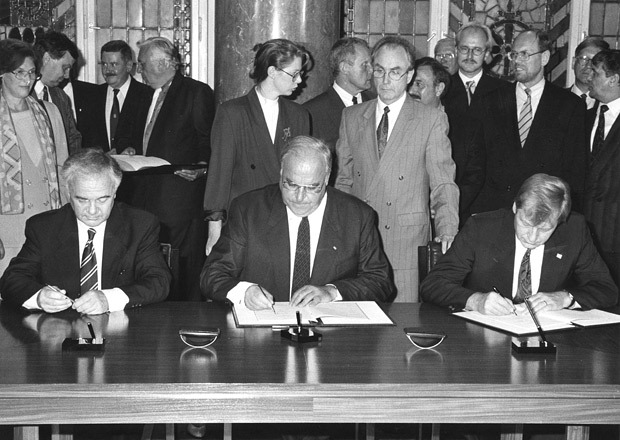 A "fair division of work" between Berlin and Bonn was envisaged, which was later defined in the Berlin/Bonn Act of the 26 April 1994.